Well, this is from quite a while ago, but I was asked to recall a former Governors cup that I had participated in and my first was THE FIRST. In 1994 I was working for The Sailboat Shop and had the pleasure of selling a new Hunter 26, which he named Wit’s End, to Cliff McCrumb, a Phoenix police officer, and real nice guy. He and his wife were going to go cruising, but his dad is a long time sailor also and had owned a few sailboats. Hunter had just come out with their new 26, which was a real departure from previous Hunters, and had a lot of freeboard, a centerboard, full batten main and working jib. You really could not put a large headsail on this boat, since the shrouds were all led to the outside of the deck and hull which prohibited an overlapping jib. This was really a cruiser with a lot of space below, an open transom and a large cockpit. Cliff decided he would like to try his hand at racing, which he’d never done, so I volunteered to crew for him, and along with a friend of his, Tom Comtois, we decided to enter this new race. 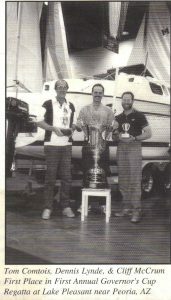 This was the First AYC Governor’s Cup. Back then, the new dam at Lake Pleasant had just been completed the year before, and none of us were real familiar with the new lake, and it was in the process of still filling, so this sounded like a real fun challenge and a cool way to learn the new lake. In 1994 the race was held on January 1st, pretty cold at night, but beautiful during the day. Cliff rented a slip at the then new marina and launched before I got there. When I arrived, like any good racing sailor, I asked him if he had cleaned out the cruising gear for the race, and could I get him a cart to take everything off the boat. He said don’t bother, we would race it like it was equipped, and we did. Sleeping bags, BBQ’s, two anchors, batteries, dinnerware, cushions, heaters, etc, etc, and with all the lockers full to the brim. I couldn’t touch a thing. With “Wit’s End” being a new boat, Cliff only had 2 sails, a working jib, and full batten mainsail (if you don’t have one, get one). The full batten main was a new toy for mono hulls back then. Anyway, we entered the non-spinnaker class, which was a 2 lap 25 mile race of the lake. There was also a 4 lap 50 mile course for the spinnaker boats. Thank goodness we did not enter that class. Starting out there was a good size fleet, and I don’t remember if we had 2 starts or just one combined fleet start, but there was very little wind and not much to come for quite a while. We settled into drifting mode, I was on the helm, trying not to pinch in a boat that had a lot of freeboard and a small headsail, but lo and behold, because of the small headsail, which was easier to fill in light to no wind, and the full batten main, we were out pointing all the boats that had a large headsail up and a standard main. This kept up the whole first leg of the race, with this sail and wind combination being just right. And with even with all the gear on board, during a lull we had plenty of momentum to carry us through. It took us the better part of a day just to get to the far end of the lake and find the first mark, which was a small buoy with flashing yellow highway emergency lights, not very bright, and prone to slipping off to one side of the buoy. Well, we found the marks at the far end of the lake, rounded them alright and tried to make compass references on the chart (remember, no GPS back then). We finally finished the first lap in the light, and then it got interesting. It was not a full moon, and it got dark at the back of the lake real quickly. We fumbled our way through the course in the black of night, with absolutely no lights at that end of the lake. Luckily we had a wide assortment of flashlights with us, (remember the full lockers) and were only scared 4 or 5 times when we would shine them down on the water and see rocks ghosting by a short distance away. Also luckily we had all brought winter gloves and jackets, and Cliff pulled a propane heater out and set it in the cockpit next to our feet. Cruising Boat, remember? We rounded the last mark and headed for the finish line at the other end of the lake at about 11:30pm and THEN the wind kicked in. We had a broad reach in about 15 knots of wind for the rest of the race and made it back down the lake in about 45 minutes, just screaming along. We had lost sight and sound of all the other boats and had no idea of where any of the competition was. We finished about 12:19, and motored to the dock. Cliff asked if we were hungry, pulled out his BBQ and proceeded to make pork chops, green beans and warm bread and coffee for the crew. Something warm to eat at 1:00 really hit the spot. Cruising boat, remember? You can imagine our surprise the next day when we were awarded 1st place in our class. We thought it was pretty amazing, and even though it got cold that night, we had a great time, never ran aground and really enjoyed ourselves. If I remember correctly, some of the spinnaker boats were finishing the next morning after a 4 lap journey.